I was looking at a chalice the other day, after dinner at my sister’s home. On the bottom the inscription read, “Rev. James J. Grogan, Ordained May 29, 1943.” Just a bit surreal, my brother offered me the use of this chalice that he has used over the more than thirty years of his priesthood; Bill has been fortunate to have the use of two chalices, each having belonged to our Uncles Tom and Jim, who together served as priests in the Philadelphia Archdiocese for 72 years before their deaths some decades ago. As my brother pointed out, it might only need to have a new ordination date inscribed a few years from now, as the name is the same. Of course, I knew Bill had these chalices, as with our uncles he has contributed his own 30 years as a priest on this anniversary year; between the three of them, more than a century of service as priests can be counted. What surprised me was the impact of reading my name on that base, and especially considering the wear on the chalice. The last ministerial act my Uncle Jim performed was blessing the ring I had just given to my fiancée in 1981 from his hospital bed, as he passed to his eternal reward two weeks after our engagement. 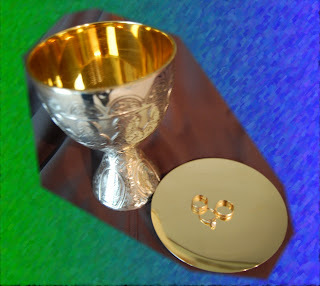 The chalice, once gold plated, is now very much two-tone, with areas where the plating has been worn off revealing the silver coloring of the base metal. This wear has pre-occupied me for the past week, as I consider the work of priests, sharing the cup around the altar and offering it to those sharing in the Eucharist. Perhaps in my Uncle’s time, this cup was more likely reserved only for priests, but in my brother’s hands, it has been shared by priests and laity, with parishioners at daily mass and couples on their wedding days. All those hundreds or thousands of people have contributed to the “silver lining” of ministry that I am now allowed to view. During this same week, I joined in a celebration of ministry for a wonderful woman, Sister Marcy Springer, a Sister of Saint Joseph for fifty years. Guiding many, including me, as a spiritual director, Sister Marcy is a woman of prayer, just as my uncles and brother have been for decades. As I pursue the discernment of my own vocation to the priesthood, each of these faithful servants stand as models and reminders to me that this journey is first and foremost a prayerful experience, a prayerful experience that hopefully draws me ever closer to Jesus in the Eucharist. I was offered a second chalice a few years ago, a gift from my parish in memory of Ellie, who they loved nearly as much as I have. That chalice, too, shows some signs of wear; used in our parish everyday liturgies for a few years, it shows some scratches. In these vessels – both the cups and our human existence – we have some scratches, some marks of suffering, of use, and of joy to be found in the silver lining of life. They are symbols of the faith we share, and of the prayers we offer in communion with one another. Please keep me and all our seminarians in your prayers, especially our newest seven transitional deacons in Trenton as they join the legacy of sacramental service to and with the People of God. God, don’t let me take today for granted! This past week, three events have come together to “excite” my discernment journey. They include providing a catechetical instruction to our parish Extraordinary Ministers of Holy Communion on the Eucharistic Life, the ordination of four men as the newest priests in the Diocese of Trenton, and I went to mass with my son. Speaking with fellow members of my home parish about the Eucharist serves as a reminder of the remarkable sacrament we share; Jesus, still incarnate in the world, present as Body and Blood, soul and divinity in the consecrated bread and wine. As I remind others about what this means, if serves to reinforce to me the emotional excitement that comes from sharing Jesus Christ with others as we celebrate the Eucharist together; I reminded those who are serving in this wonderful ministry that they should be awestruck every time they are invited to place Our Lord in the hands or on the tongue, or to carry Jesus to those who are in hospitals or homebound. Speaking about this with others only served to reinforce for me that while so many activities or parts of our busy daily lives may be taken for granted, the presence of Jesus in the Eucharist should never be routine; His presence truly is the source and summit of our faith lives, and I hope never taken for granted. This past Saturday, four men were ordained by Bishop O’Connell as the newest priests in the Diocese of Trenton. Beyond the remarkable liturgical ritual of the day, I found myself reflecting on the fact that I have many priests – including these new men – who in various ways serve as models of this vocation I am pursuing, and who have and continue to provide counsel to me in my journey. Some, like my pastor, have only known me as a permanent deacon. Others, like the newly ordained Father Garry Koch was part of those who helped me on my last discernment journey, as one of the faculty in our Diocesan formation program for the permanent diaconate. Others, such as my cousin and brother, have known me for my entire life, and their discernment to the Franciscan and diocesan priesthood were conversations I shared fifteen or thirty years ago – conversations which occasionally come back to my mind in vivid detail. I am indeed fortunate and blessed to have so many good, holy, and different men whose lives and conversations help me in my journey, and whose continued counsel and friendship are essential for the years ahead. The different places at which they have entered my life leads to different questions and challenges they raise for me, and through that diversity they ask questions that help me respond to God’s call. As one who is weeks away from becoming a seminarian, I also understood that attending an ordination for the priesthood is an entirely different experience than for most; as seminarians, we cannot help but wonder about when that ordination day may be ours. We not only feel joy for the men ordained this day, but both profound excitement and trepidation about our own readiness and worthiness for that step ahead. Discernment is a daily event, but ordination days during this journey are particularly powerful moments, and not to be taken for granted. Finally, on Sunday I went to mass with my son, who had just returned home from working 300 miles away for the past year. For many, that “going to mass with my son/daughter” would be an innocuous phrase. For me, however, as a deacon, it is anything but; besides the fact that recently, most of the time my sons are either away at school or work, but also that most weekends I am up on the altar as a deacon, not beside them in the pew. Being together, responding to points made in the homily, noticing others in the pews around us, and sharing the sign of peace are no longer routine, but special and important moments. They are also moments that will become increasingly rare in the years ahead. For me, they are also the conversations between a father and sons about the priesthood. For many parents, that conversation is about the son’s discernment, while for me it is seeking the advice and questions of my sons about their father’s journey. They are conversations never to be taken for granted.